25th May 1940, aged 21. Son of Albert and Mildred Ann Penniston, of Trent Bridge, Nottingham. Husband of Irene Pickering, of Hull. 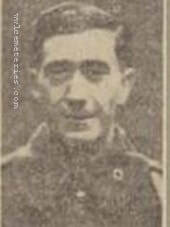 T/129665 Driver Alfred James George Templeman, 11 Troop Carrying Company, Royal Army Service Corps, died25th May 1940, aged 23. on of Alfred George and Emily Fanny Templeman; husband of Hilda Templeman, of Enfield, Middlesex. 37915 Private G. T. Paget, 18th Bn., Welsh Regiment, died 19th July 1916. Lieutenant Denis Percival Beauchamp Taylor, M. C. 3rd Squadron and 3rd (King's Own) Hussars, Royal Flying Corps, died 14th March 1916, aged 21. Son of Col. Philip Beauchamp Taylor, C.B.E.